It may not look that exciting, but our “safety net” map has been a through-line for me this past quarter. We are on break this week, which I hoped would give me a break too, to get a sense of whether the students are getting anything out of our “no cooking” culinary careers classwork. 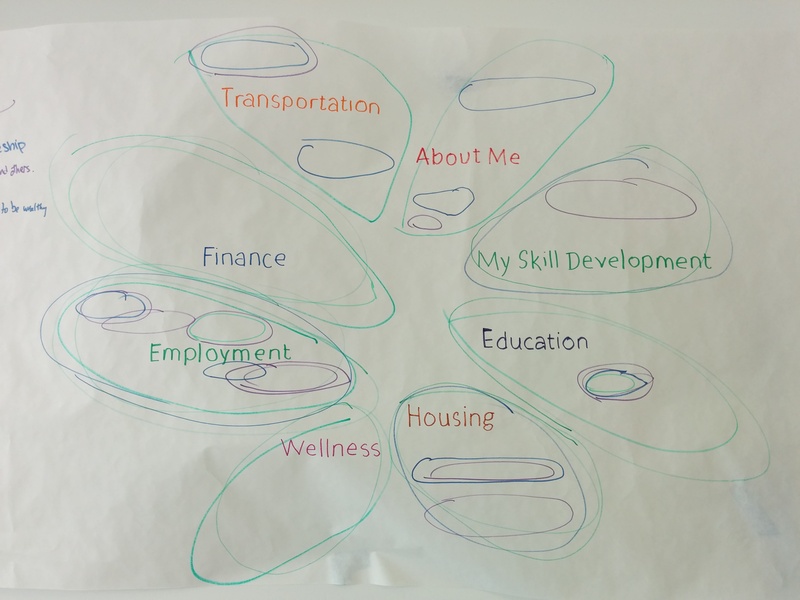 On this map, students circled areas of interest that they want to learn about in the 8 weeks we are together. Even though you can’t see all the detail that was circled in this picture, I like this map because it proves a point to me. Yes, young people want jobs, they want to be more secure and be able to make choices after high school, not be dealt with, which is how school still feels at this age for many of our students. We’ve got some exciting projects that we hope will help students feel more prepared, confident, connected (keyword tip offs here: Quince! Garden!). The timing might be right, then again, it might not. It doesn’t change our appreciation for those of you who are jumping in and getting involved. Thank you. Students notice even when they choose to stay on the sidelines and many of them move one step closer to getting involved as a result of your involvement. The message that comes with every volunteer or industry person who brings an opportunity to our school is that very important “I care even though I don’t know you,” message. This message helps to offset the litany of other messages that inner city youth receive which default, intentionally or unintentionally, to lack of care or inability to care. The more times our students witness that unconditional “I care” message, the more they can prepare to step outside what is defaulted to them. This picture is one more sign to me that they want to do that. And, as we all send out our caring messages, what keeps me going is looking forward to when young people begin to realize how amazing they really are and get in touch with their own limitless potential. This kind of discovery is awesome, isn’t it? It is why our class is designed for students to be able to cook and eat together at that professional level. it is a catalyst right into opening those deeper discovery doors that too often are shut for our inner city youth. Yes, I can’t wait to start cooking with them in a real kitchen again. Quince Sale April 9th & 10th! i love your safety net map! Growing opportunities and hearts and minds! Very cool to think (and cook those ideas) organically – it looks like pots on the stove to me! Thank you, Chef Alice, for putting caring into action!